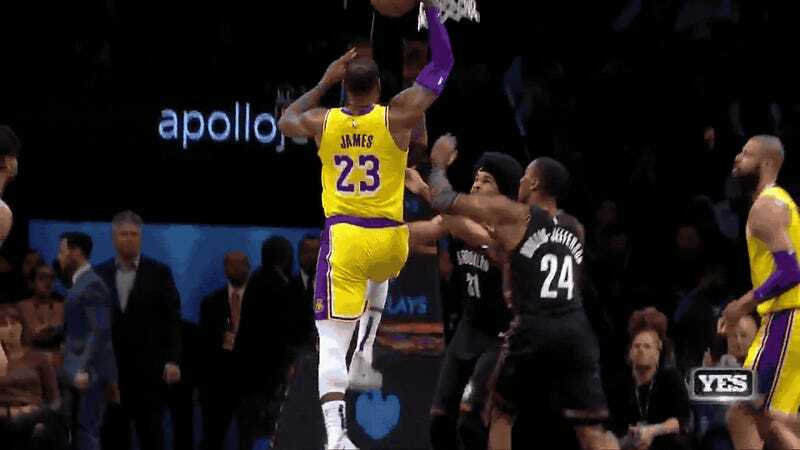 They say that in times of intense stress, human beings can manage to perform impossible, superhuman feats of “hysterical strength.” I can’t think of a more terrifying situation than seeing LeBron James barreling directly at you with eyes on a monster slam, but for young Brooklyn Nets big man Jarrett Allen, adrenaline did its job, and it allowed him to rise up and meet James for a brutal rejection. You’ll notice that after the block, Allen goes tumbling to the ground while James still lands perfectly smoothly on his feet. Allen’ll take it.